PLEASE JOIN US!! 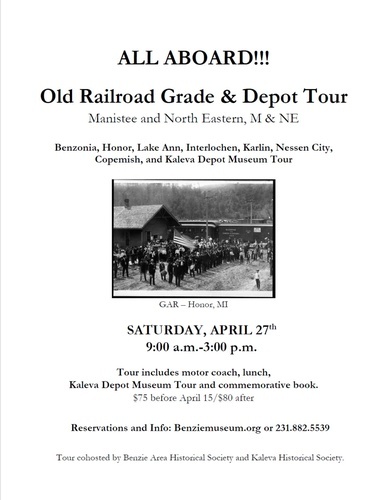 Railroad and history enthusiasts are invited to join us for the Manistee & Northeastern Old Railroad Grade & Depot Tour. 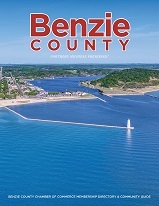 This is a return of the Benzie Area Historical Society’s popular motor coach tours of local railroad history. In the spring of 1887, the Buckley & Douglas Lumber Company of Manistee began building a railroad to transport logs from the forest to its sawmill in Manistee, and they named the railroad the Manistee & Northeastern. At its peak in 1915, the M & NE carried 190,000 passengers. The tour starts at the Benzie Area Historical Museum and will follow the M & NE railroad grade route to Honor, Lake Ann, Interlochen, Karlin, Nessen City, Platte River Junction, Copemish, Thompsonville, and Kaleva. A highlight will be a tour of the historic Kaleva Depot Museum which was rebuilt in 1908 following a fire. Tour includes motor coach, lunch, Kaleva Depot Museum Tour and commemorative book. 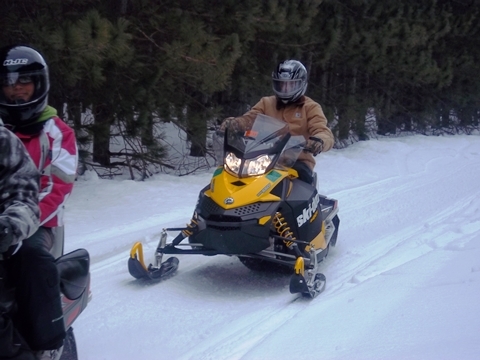 This tour is a collaboration between the Benzie Area Historical Society and the Kaleva Historical Society. Call the Historical Museum at 231-882-5539 with questions. Tickets are $75 before April 15, $80 after.